This week, I feel like I’ve been involved in an epic battle with my house- a battle to be organized and sane! Unfortunately, my house appears to have won handily, judging by the looks of my daughters’ bedroom (I swear a tornado has taken up permanent residence in there). Oh yeah and the stacks of clutter on any and every flat surface throughout the house. The clutter just mocks me now as I move from room to room and I’m pretty sure the house would have swallowed me whole by now, but it couldn’t figure out where to put me. As I wade through piles of laundry, I dream of a home where there is a place for every thing and everything is in its place. I fantasize about putting a fresh coat of paint on all of the walls my 2-year-old thought were paper… which incidentally is pretty much every wall in my house. “To be organized or not be organized?” That is the question. But, the optimistic side of me believes there just has to be hope for me- even with 5 kids in a cozy cottage. And that hope came in the form of a thought to reach out to my cousin, Dianne, who is an expert organizer. Her gift of organization has helped restore the sanity of many a mother… and now I needed it to restore mine. 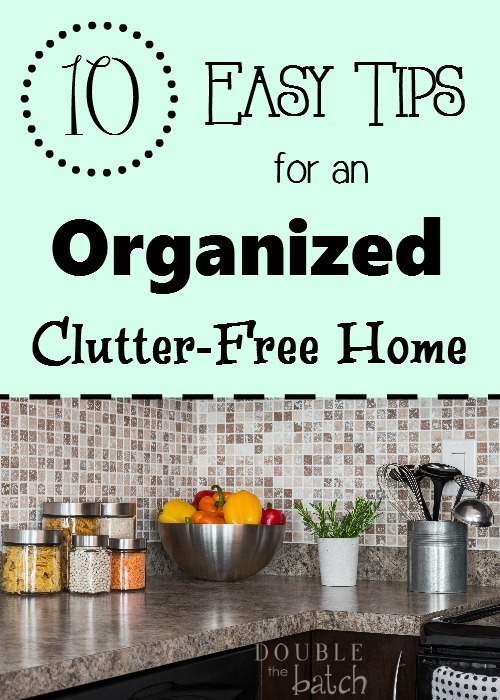 I contacted her and begged her to share with me her top 10 tips for an organized home and conqueror in my next clutter battle with this house. Lucky for you, I am willing to share this fantastic advice she gave me. It might just change your life. Read on. Dianne is a big fan of Peter Walsh. She highly recommends reading his book It’s All Too Much if you are looking for some great inspiration to get you going. 1- Don’t be afraid to let go of “things” in your life. Decide you are going to organize and declutter a single shelf, drawer or cupboard in your home. Do not move on until you are done. Grab 2 boxes and a big plastic garbage bag. Label the boxes “Put Away” and “Give Away”. The bag is for trash. Touch each item once. The “put away” box should be emptied at the end of your little decluttering session by putting everything in it back where it belongs. 4- In your clothes closet, turn all of the hangers backwards. 5- Keep “like” things together. Think of the old “Sesame Street” song. Is one of these things not like the other? Then, it needs to be with it’s friends. For example, I was helping a friend who had a computer and desk on her upstairs landing. Next to it was a nice cupboard. She said, “I just don’t know where to put my office supplies for my computer”. I opened the cupboard to find sheets and blankets. Hmmmm…We decided the sheets and blankets should be in the bedroom with “like” things and the office supplies should be near the computer. Seems simple enough, doesn’t it? Guess not. 6- In the kitchen, try and rid yourself of the junk drawer. Use inexpensive drawer dividers to keep like items together. No floating paper! Use 3 ring binders for recipes, calendars, phone lists, kids schedules, school papers, manuals and warranties, etc. Clean out your refrigerator once a week. It takes less time than you think and you will save money by knowing what you already have in there and use up what is getting old! 7- In the bathroom you can get rid of old perfume (it has a shelf-life of 3 years). Most make up goes bad in 6 months. Go through your medication and toss expired drugs. Don’t keep those little bottles of shampoo you’ve collected, donate them to a women and children’s shelter. Use a ice tray to organize your earrings. 8- For children, less is more. I love using the “Toy Story” movie in educating kids about organization. All their toys should “live” somewhere. At the end of the day, they all need to go “home”. Label bins or put photographs on the bins of the toys that live there. Before Christmas and on birthdays, go through the toys with the child and see what they might want to give to another child in need. Have a designated place where backpacks, sports gear, jackets, etc. go when they come home. Put children’s schoolwork and artwork in a binder. At the end of the year, you and the child go through it and pick their very favorite to be put in an online photo book to keep forever. Reward your children with experiences instead of “things”. For example, a date at the park or museum. 9- There are certain spaces in your home that are limited in what they can hold. A bookcase, for example, can only hold so many books. A good rule of thumb is if you buy a new book, you need to get rid of one. Same with DVDs. Ask yourself if it would bother you if you never read the book again or watched the DVD again. You’ll be surprised how much you can let go. Everything should have a home and it should not be overcrowded. At the end of the day, everything needs to be “home”…just like your child’s toys. 10– If you get it out, put it away, if you open it, close it; if you finish it, replace it, if it’s full, empty it. You take it off, hang it up; if it’s dirty, wash it. If it’s garbage trash it. It may seem like you don’t have time to do these things right away (or motivation), but if you do it anyway, you will be much happier and have saved yourself an amazing amount of time. I think this is one of my biggest tricks to being organized. I don’t let things “sit” and they never accumulate into a big task. Now, while you are digesting all of this helpful information, if you will excuse me- I have a battle to win. Check out this post by Katie for more tips on getting organized.